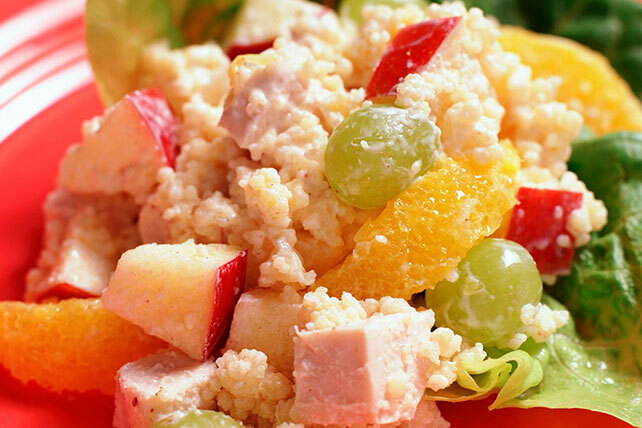 Tender bite-size pieces of chicken breast and fruit add savory and sweet to this tasty couscous salad. Bring water and 1/4 cup dressing to boil in small saucepan. Stir in couscous; cover. Remove from heat. Let stand 5 min. Fluff with fork. Place couscous in large bowl. Add chicken, oranges, grapes and apples; mix lightly. Mix mayo and remaining dressing until blended. Add to couscous mixture; toss to coat. Stir 1 tsp. orange zest into mayo mixture.